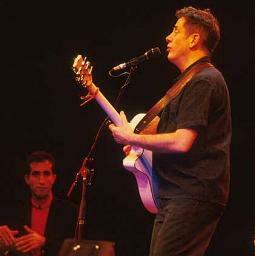 The younger brother of Irish singer-songwriter Christy Moore, Luka Bloom (AKA Barry Moore) decided to relocate to the United States in 1987. 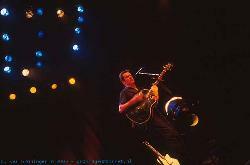 Re-christening himself Luka Bloom during the plane trip (Luka from the Suzanne Vega song, Bloom from James Joyce's 'Ulysses'), he took the first step toward establishing his new identy. A master interpreter, Bloom has always balanced original songs with reinventions of material by a diverse range of songwriters. His reworking of LL Cool J's 'I Need Love' transformed the song from its hip-hop origins to a brogue-inflected folk tune, while his 2000 album 'Keeper Of The Flame' featured covers of songs by Bob Dylan, Bob Marley, ABBA and Radiohead. 'Between The Mountain And The Moon', Bloom's first full album of original compositions on his own label, revisits the characters and folklore of his native Ireland. 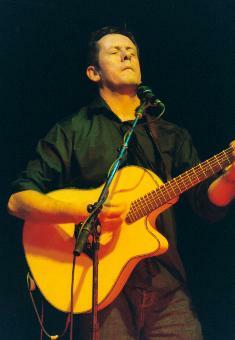 Launching his career in the 1970s, Bloom was encouraged by his brother, who hired him to play with his groups Planxty and Moving Hearts. He recorded three impressive solo albums in the 1970s and '80s before leaving Ireland for Washington, D.C. Determined to earn an audience on his own merits he took a residency at a Georgetown pub, where he honed his solo act. 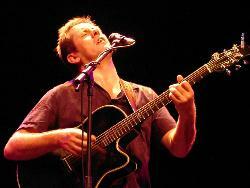 Bloom's reputation as a skilled guitarist and uplifting performer continued to grow. 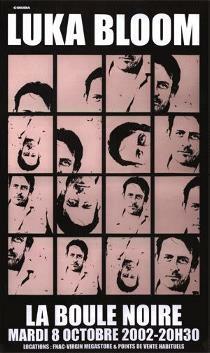 Accepting a second residency at the Red Lion in New York's Greenwich Village, he began to shuttle between the two clubs. By the end of the year, he had elected to make New York his home. 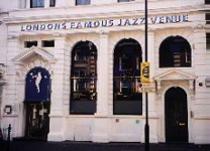 The decision proved fortuitous when his show at the Red Lion was caught by a talent scout from Reprise, who signed him to the label. He subsequently released three acclaimed albums with Warners and one with Sony, before returning home to Ireland where he has continued to record and tour to great acclaim. 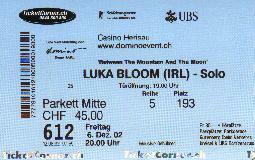 Between heaven and earth, from valley to top, between mountain and moon, that's where the Irish bard Luka Bloom always takes his audience to. 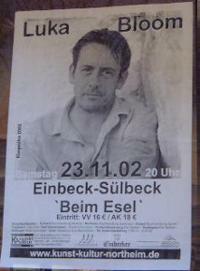 That goes for his latest cd with the uplifting title "Between the Mountain and the Moon" as well. What's more, the man is quite productive lately, with an overview of his earlier years on the recent album "The Barry Moore Years" and the occasional project "Keeper of the Flame", on which Luka Bloom brings a selection of his musical inspirations, from Bob Dylan to The Cure. This energetic zealousness reveals Bloom's great respect for music. He gives his guitars affectionate names and plays them as if they were his self-created lovers. From this man you can only expect passion, fire, sweat and open-handed eagerness. 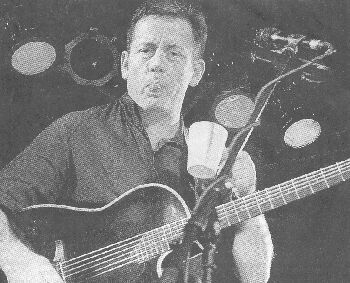 The music on the eponimous cd already tickles like some mild highland whiskey, but when you experience the hallmark Luka Bloom in live performance, you realise why the Indians called it firewater. "Her name is Alyanya. 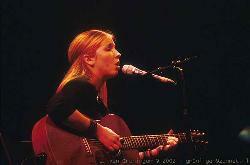 She has just written her first songs, and done her first shows, in Ireland, with me. She has a lovely quiet confidence, which makes her completely natural on stage. Her voice is pure and true, as are her songs. I feel happy to guarantee that people who come to hear my show, will enjoy her." 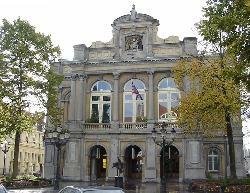 Rotterdam - When Irish singer Barry Moore was flying several kilometres above his future homeland America in 1987 he did two things. 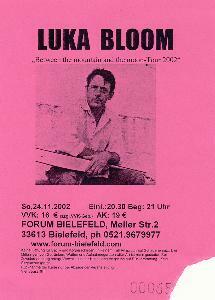 First of all, he took on the stage name Luka Bloom. 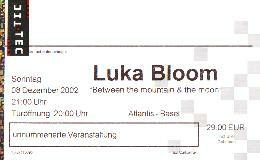 Luka after Suzanne Vega's song of the same name, and Bloom after the main character of James Joyce's novel "Ulysses". Secondly, he decided to create a solo career, independent from record companies and aimed at a rock audience. Weekend shows were not a part of that. 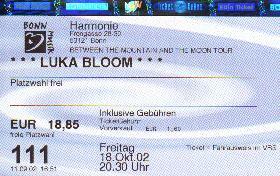 Bloom only wanted to play on Monday, Tuesday and Wednesday, so the audience would really come to listen to him. So the acoustic solo guitar player repeated last night at the new Luxor Theatre that Monday is his favourite day to perform. And next he played a passionate rendition of the song "You", dedicated to the audience, and he went on to excel for two hours on the steel strings. Bloom's (1955) work can be roughly divided in two. One half consists of folky chords played like lightning, the other half of quiet and clear, subdued strumming. Both he played with great craftsmanship and precision last night. But too much resonance deprived the fast numbers a little of their subtlety. Bloom knows how to create an orchestral dimension with his three six-string guitars (Rudy, Judy and Coogee). And then he may be a little loud, even all by himself. Apart from that Bloom gave a very warm and nearly faultless performance last night. Much of his charm is derived from his pretended nonchalance. Bloom waddles across the stage stiffly, as if he came straight from the pub. 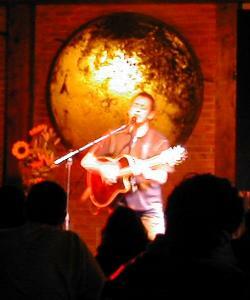 He makes carefully rehearsed jokes, inserted spontaneously between songs. And he knows how to take his audience effortlessly from melancholy to joy. Bloom always remains the honest and straightforward Irishman. Not with a thick tongue, but with a genuine accent. Known particularly for his own songs, Bloom also played a number of covers last night. 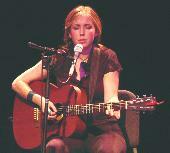 Joni Mitchell's "Urge for Going", Bloom's favourite autumn song, strummed like a steel waterfall. Bob Dylan's "Make You Feel My Love", reduced to a few simple chords, leaning heavily on Bloom's powerful voice. And Bob Marley's "Natural Mystic", a funny Irish-Jamaican mix, coming from a love for reggae that Bloom shares with his Irish support act Alyanya. 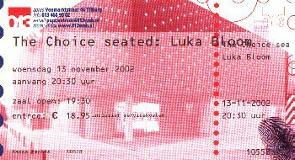 Strong numbers by Luka himself were, among others, "Dreams in America", and "Love Is A Place I Dream Of". Encores were the slightly off-key, but intensely spiritual "Gabriel", and the stamping folk hit "You Couldn't Have Come At A Better Time". 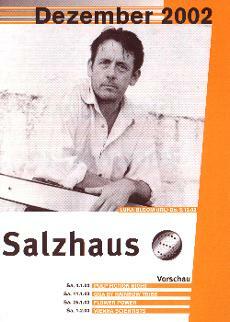 Also obligatory, the cover that gained Bloom his great fame here in 1992: L.L. Cool J's "I Need Love". Yes, the lighter song. Though Bloom warned the audience about this at the start. "Folks, leave the lighters in your pockets. Or it is time for me to retire". 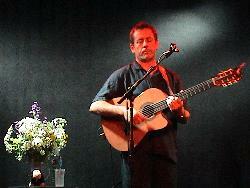 Luka Bloom at the new Luxor Theatre. 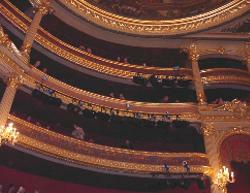 When indolence threatens, Luka asks the people sitting in the balcony to take the empty chairs in front of the stage. 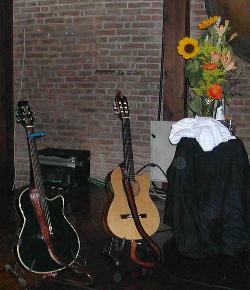 The slightly formal atmosphere is suddenly transformed into an intimate concert. A little later the audience gathers together in front of the stage. 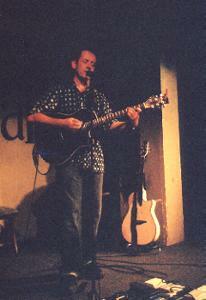 "It is as if my concert only starts now", the Irish singer and guitarplayer jokes. But it is not a joke. When he finishes with the lesser known "You" - from the old cd "Acoustic Motorbike" - it is obvious that this is not the end of the show. The audience movingly sings along with "The Fertile Rock", one of five encores, as they did with "Sunny Sailor Boy" earlier on. After a two hour show without a break the Irishman proudly mingles with the enthusiastic crowd in the lobby. 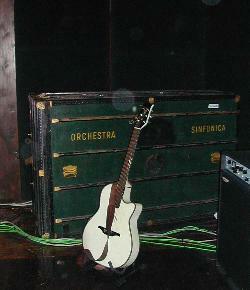 One singer and a guitar, you can't really get smaller than that. 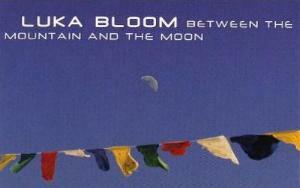 Luka Bloom, however, is the ultimate one man band. He combines great guitar technique with carefully worked out amplification. He has no problem at all with the combination of chords and solos. And the high speed at which he moves his strings makes them sing. His latest cd "Between the Mountain and the Moon" - a year old by now - exudes the quiet of the Irish countryside Luka returned to after a long period in New York. 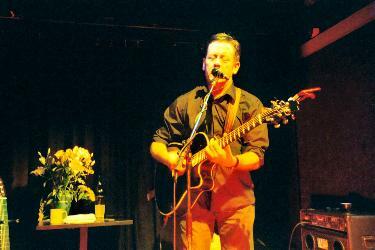 But in his concert he is still the energetic, rocking city singer-songwriter, with a warm voice, which this time had a little more trouble with the higher notes. 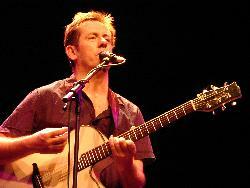 Luka Bloom shows himself to be a master of the dynamic. With great subtlety he strums the strings during "Keeper of the Flame", while he punishes them with his plectrum during songs like "Ciara" and the new "Bogman" (Ik ben een boer, he translates into fluent Dutch). The classic "Black is the Colour (of my True Love's Hair)" he extends with a spine tingling guitar solo to a true highlight. More were to follow, like "Gabriel" and most of all "Love Is a Place I Dream Of". In this very sensitive song Sinéad O'Connor sings with Luka on the CD, here 20 year old Alyanya takes on that role surprisingly. 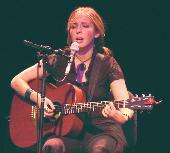 This talented Dublin singer-songwriter also opened for Luka, and she reminded us of Suzanne Vega. If her guitarplaying gets a little of Luka's dynamic we will hear more of her. 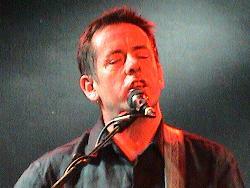 Luka Bloom, Friday 15 November 2002, Muziekcentrum Eindhoven. 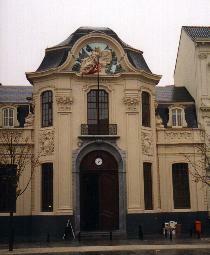 The first tour in Dutch theatres of this singer/songwriter was a huge success. Public and press alike were equally enthusiastic. 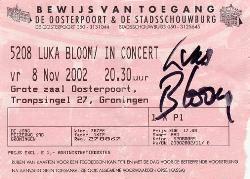 Now Luka Bloom is back for his second tour in Holland, in which he will treat his audience to Irish folk, but also alternative pop, rock and reggae. 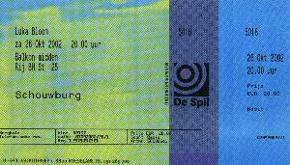 for photos, posters, setlists, reviews and information of the tour!